Fair Oaks Presbyterian was looking for a change. The existing sound system in the sanctuary was roughly 20 years old and was dying. Congregation members often complained that they could not hear. So the church leadership gave Wade Odum, Director of Media Technologies, a charge: Install a new sound system and help prepare this church for ministry in the 21st century. Mr. Odum contacted Novo immediately, having worked with us on previous projects. He had two primary goals: install a PA system that would evenly cover the 1150-seat sanctuary, and a mixer that would give as much flexibility as possible. To meet his first goal, we began to work with Odum to find a design that would work in the Fair Oaks sanctuary. A variety of designs were considered, but a hybrid-LRC system consisting of Nexo PS-15s was finally determined to be the best solution to the coverage problem. 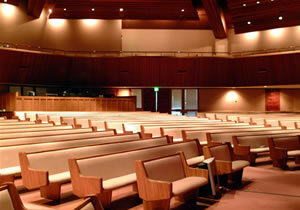 The sanctuary is fan-shaped, with a center aisle which creates two halves in the room. Each half was equipped with its own LRC system: the left and right arrays each consisted of a Nexo PS-15, PS-15 Bass, and PS-8 for downfill, and the center array consisted of a PS-15. A pair of Nexo CD-18 cardioid sub-bass cabinets was specified. The result was remarkably even coverage front to back and left to right across the entire frequency spectrum. Additionally, 6 PS-8s and two LS-1200s were specified for balcony fill. To power all of the speakers, we specified the Crown I-Tech series for the main arrays: three I4000s for the left, right, and center arrays, and two I6000s for the subs. The I-Tech amplifiers were all installed within 10 feet of the arrays to minimize power losses.